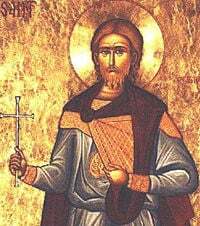 Saint Alban was the first known Christian martyr of Britain. Shortly after his conversion, he allowed himself to be mistaken for the priest who converted him and to whom Alban had offered hospitality during a persecution. Traditionally believed to have died c. 304 C.E. during the reign of Diocletian, his dates are now disputed and may have been somewhat earlier. Along with saints Julius and Aaron, Alban is one of three martyrs remembered from Roman Britain. Alban's career as a Christian was extremely brief, being executed shortly after his conversion. However, several miracles are associated with his death by beheading, including that he changed the course of a river on his way to the site of his death and that his executioner was struck blind as soon as he delivered the fatal blow. Alban's feast day is celebrated on June 22, and he continues to be venerated in the Anglican, Catholic, and Orthodox faiths. His cathedral at the town now named for him is one of the largest in England. In recent years, Alban has been considered as a candidate to replace Saint George as England's patron saint, since George never lived in England and his legend is less historically based than Alban's. The martyrdom of St. Alban, from a thirteenth-century manuscript, now in the Trinity College Library, Dublin. Note the executioner's eyes falling out of his head. According to Bede's Ecclesiastical History of the English People, (I.vii and xviii), Alban was a pagan living at Verulamium (now St. Albans). He offered shelter to a priest who was fleeing from persecution and was consequently converted to Christianity and received baptism. Soon after, when the governor's emissaries came to search the house, Alban disguised himself in the clerical cloak of his guest and gave himself up in his place. He was dragged before the judge and scourged, but refused to deny his new-found faith. Condemned to death by beheading, on the way to the place of execution Alban is said to have miraculously stopped the course of a river so that he and his executioners crossed dry-shod. He also caused a fountain of water to flow on the summit of the hill on which he was beheaded. St. Alban's Abbey was later founded at this site, near Hertfordshire. His original executioner is said to have been converted at the scene, refusing to carry the sentence. The man who replaced him, after striking the fatal blow, was immediately struck with blindness, with his eyes falling out of their sockets. 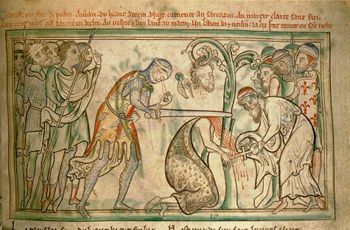 Geoffrey of Monmouth's later account gives the name of the cleric who converted Alban as "Amphibalus," adding that the priest himself did not escape martyrdom, being stoned to death a few days later at Redbourn, four miles from St. Albans. Bede's account leaves the date of Alban's death less than specific, saying that it occurred "when the cruel emperors first published their edicts against the Christians." Bede seems to have meant this to indicate sometime after the publication of the edicts by [[Emperor Diocletian in 303 and before the proclamation of the toleration Edict of Milan by co-ruling Constantine I and Licinius in 313. The year 304 has been assigned as his year of date by tradition. However, today, this date has come under more careful review. In 1968, English historian John Morris suggested that Alban's martyrdom actually took place during the persecutions under Emperor Septimus Severus in 209. Morris based his claims on earlier manuscript sources, unknown to Bede, especially a manuscript found in Turin which states, "Alban received a fugitive cleric and put on his garment and his cloak that he was wearing and delivered himself up to be killed instead of the priest… and was delivered immediately to the evil Caesar Severus." Morris contends that Bede's apparent source, Saint Gildas, knew this work but mistranslated the name "Severus" as an adjective and wrongly identified the emperor as Diocletian. Bede accepted this identification as fact, and dated Alban's martyrdom to this later period. However, Diocletian reigned only in the East, and would not have been involved in British affairs in 304. Severus, however, was in Britain from 208 to 211. Morris thus dates Alban's death to 209. Subsequent scholars (W.H.C. Frend and Charles Thomas for example) have argued that such a single, localized British martyrdom in 209 would have been unusual, and have suggested the period of 251-259 as more likely. Alban has been continuously venerated in England since the fifth century. He is first mentioned in historical sources about 480, at which time his tomb was already known. The legend related by Bede is thought to have been in existence in the first half of the sixth century, and was used by Gildas before 547. A cult connected with Alban was already in existence in the sixth century. In some later developments of his legend, Alban is depicted as a soldier who had visited Rome. He is often represented in art as carrying his severed head between his hands. This detail of his tradition may come from confusing him with another martyr of the same name: Saint Alban of Mainz, or Albinus, who was decapitated by the Vandals in 406. This saint is specifically said to have carried his head on his hands to the place where he wanted to be buried. In 2006, some members of the Church of England clergy formally proposed that Alban should replace St. George as the patron saint of England and that he should be patron saint of Britain as a whole. Supporters of the change point out that Alban's story is better attested, as well as being an example of self-sacrifice and martyrdom, while George's legend is both more mythical and not associated with Britain. 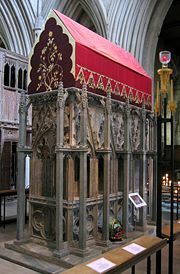 St Albans Cathedral (formerly St Albans Abbey) is an Church of England cathedral church at St Albans, Hertfordshire, England. Its nave, at 84 meters (275 feet), is the longest of any cathedral in England. The Benedictine abbey and Anglican cathedral have a long and storied history. With much of its present architecture dating from Norman times, the foundation became a cathedral in 1877. In recent times, Robert Runcie, later archbishop of Canterbury, was bishop of St Albans from 1970 to 1980. He returned to live in the city after his retirement and is buried in the graveyard. Besides his abbey and cathedral, churches in England dedicated to Saint Alban include St Alban, Wood Street in the City of London, another in Withernwick in the East Riding of Yorkshire, and one in Southampton. In Switzerland, the "Albanifest," the largest annual festival held in a historic Swiss town, is named after Saint Alban, taking place place in Winterthur, where Alban is one of the city's patron saints. The Fellowship of Saint Alban and Saint Sergius is a religious organization founded in 1928 to facilitate contact between Anglican and Eastern Orthodox Christians. The Washington National Cathedral, an Episcopal church in Washington DC, is located on Mount St Alban. His feast day is celebrated on June 22, although it had also been assigned to June 17 in the Church of England, apparently due to a misreading of the Roman numeral XXII. ↑ ROCA, Orthodoxy’s Western Heritage—St. Alban the Martyr. Retrieved January 14, 2009. Henig, Martin, and Phillip Lindley. Alban and St Albans: Roman and Medieval Architecture, Art and Archaeology. Leeds: British Archaeological Association, 2001. ISBN 9781902653396. Hunter Blair, Peter. The World of Bede. New York: St. Martin's Press, 1971. ISBN 9780521398190. Lydgate, John, and George F. Reinecke. Saint Albon and Saint Amphibalus. Garland medieval texts, no. 11. New York: Garland, 1985. ISBN 9780824094362. This page was last modified on 5 August 2015, at 20:26.